At Great Island on the eastern entrance to Hyannis Harbor. Privately Owned. Point Gammon’s construction was unique compared to many New England lighthouses in regards to its stone structure. It was used to warn mariners of a large group of menacing rocks known as the Bishop and Clerks. The first Keeper was Samuel Peak, whose teenage son John took over after Samuel’s untimely death in 1824. John and his wife raised nine children at the lighthouse with two of his sons becoming lighthouse keepers. By the mid 1800’s as traffic increased by Point Gammon with the opening of the railroad in Hyannis, the light was deemed as ineffective and a lightship was stationed close to Bishop and Clerks rocks until a lighthouse later on was built on that site. The Bishop and Clerks light was decommissioned in 1928 and razed in 1952. Point Gammon light has been in private residence since 1872. In 1882 the island was sold to a wealthy ornithologist who set up the island as a game preserve. The old stone building was used as a museum for their butterfly collection. The villages of South Yarmouth, West Yarmouth, and Yarmouth offer a blend of historic 19th century architecture and a wide variety of outdoor activities and nightlife for travelers. Yarmouth is one of the Cape’s tourist capitals with the largest number of lodging rooms on Cape Cod. The lighthouse is best viewed by boat since the area surrounding the lighthouse is private property and is carefully restricted. The Catboat Rides out of Hyannis sail past the lighthouse for visitors to get a close up view. Great Island itself is a narrow, sandy peninsula jutting several miles southward in the Cape Cod Bay and is definitely a hikers paradise. It is challenging as hiking goes. Yarmouth and Hyannis offer plenty of activities for tourists like beaches, golfing, shopping, sailing, biking, and lots of events, including nightlife. You can enjoy whale watching out of nearby Hyannis. The Cape Cod Melody Tent in Hyannis offers plenty of music and theater acts during the summer season. Catboat Rides mentioned below may offer many other types of sailing cruises out of Hyannis Harbor. 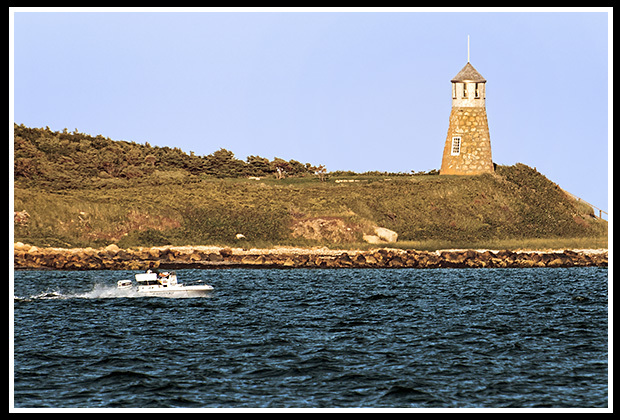 Sailing cruises includes Hyannis Harbor and special Blue water cruise that includes Point Gammon light. Wind directions always determine sailing.